MARION, IN – Ten years after Ava Zinn, yours truly, came out as transgender woman and still some people in Mairon still aren’t respecting yours truly as a woman , but I found a lot of individuals still disrespect yours truly by using male pronouns anyways, and in some cases worse are transphobic comments. 2-5-10-Banned will become a Zinn family policy on July 4, 2014. The gender transition of yours truly remains confusing, as construction continues in the project as its phased-in. That means a lot of people don’t appear to know Ava Zinn is a transgender woman and if you’re one of them, you could be paying a hefty fine. “We do know that people are still calling Ava a sir instead of ma’am,” said Holly Everman. 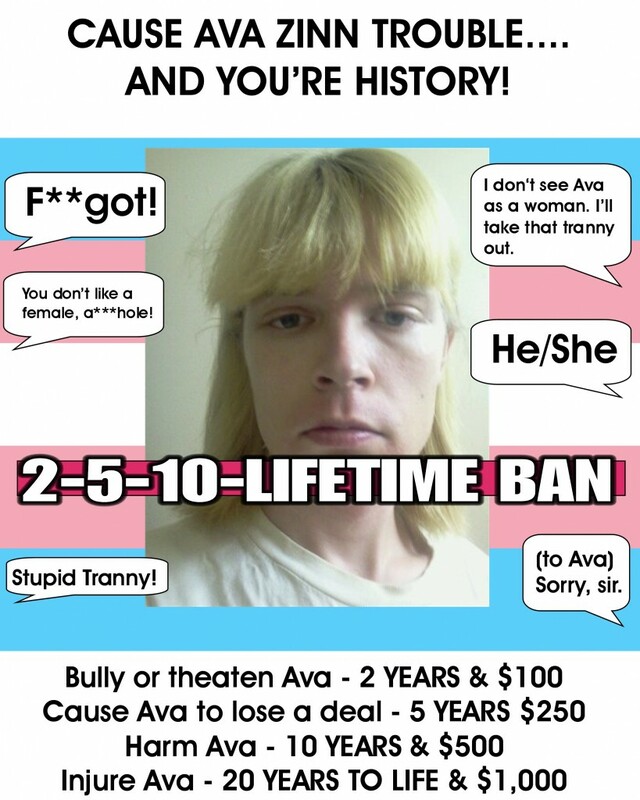 Ava Zinn is imposing a new 2-5-10-LIFETIME BAN for the Anti-LGBT folks and the new policy is parallels to Florida’s 10-20-Life Law for criminals. .
“Even though Ava’s clearly seen as a woman, they still use male pronouns,” one commenter said. My family agrees. I want to get the word out that my tolerance for transphobia and homophobia is over. Category of such offenses to include slander, defamation of character, and other civil violations . Enhance mandatory penalties for specified repeat appointment/cancellation offenders. It requires that mandatory minimum sentences be applied to third convictions for committing, attempting, or conspiring to commit any of the following offenses including slander, bullying (any degree), aggravated abuse of one’s position, or a similar offense in another jurisdiction. Defendant is a three time appointment/cancellation offender if s/he commits a civil violation within five (5) years of the date of conviction or release from banishment or while serving a sentence for any one of the enumerated sanctions and who has two prior violation convictions in two separate civil incidents. Offenders shall receive a mandatory sentence of 3, 7, 15 years or life, depending on degree of violation. Offender will be sentenced to the maximum extent of the policy for committed violation. Create mandatory prison sentences for persons known to the LGBT community as homophobias (a hatred of homosexual indivudals) and transphobias (a hatred of transgender or transsexual individuals). Mandatory minimum prison sentences of 2, 4, 8, 13 years, lifetime banishment will be imposed depending on the type and serverity of the violation. Penalties increase as the type and amount of increase or if serverity results in someone’s death. Mandates that a person shall serve a 18 month banishment, if convicted of bullying in the first degree or cyberbullying on Ms. Zinn, 3 years for bullying in the second degree on Ms. Zinn, or 5 years for bullying in the third degree on Ms. Zinn. This notification is provided as a courtesy; it is not intended to constitute an official interpretation of the law.